“On the day I found out I had Cancer, I was also given a CT scan, the day after I met with my Surgeon. He told me it hadn’t spread but it was likely a T3/N1/M0. So surgery was needed and he could do it on Saturday April 1 for me. The speed in which this happened meant that I had no time to worry, and that was a blessing. No time to think about what surgery meant or how I would be after. Telling the boys was easy, I just told them the truth ‘Boys, mummy has a lump in her tummy, its making mummy sick, so I am going into hospital for 5 days to get it taken out. When I get home, I am going to be sore, and we will need to be careful with mummy and her tummy for a couple of weeks. What you need to know is that it won’t hurt mummy to take it out, as the doctors will look after me, and I will be back home in time for Oliver’s 4th Birthday, and his birthday party will still be going ahead. Is that ok boys?’ ‘Yes mummy’. Wow. Surgery. Sh**. Do not recommend. Although 4 days later, I went home, so actually it wasn’t that bad, just when you are going through it. Wow. During my hospital stay, I felt smelly and stale and not myself, no matter how much nice smelly shower gel I put on or how long I cleaned my teeth. Being ill, it's so humiliating and humbling and takes u to a dark space. My sister didn’t let me settle there though. She kept dragging me back up to the light. And Damian, my husband, did not leave my side once I came out of recovery. Staff said nothing. Just found him a bed. So I felt like crap, but I also felt loved." Anna Gilmour, 38 from Surrey, was diagnosed with bowel cancer in March at the age of 38. Throughout June, Anna has been taking part in our brand new campaign Step up for 30. She's been running, walking and cycling her way through the month, all the while undergoing treatment and raiaing an incredible £2,449 so far. 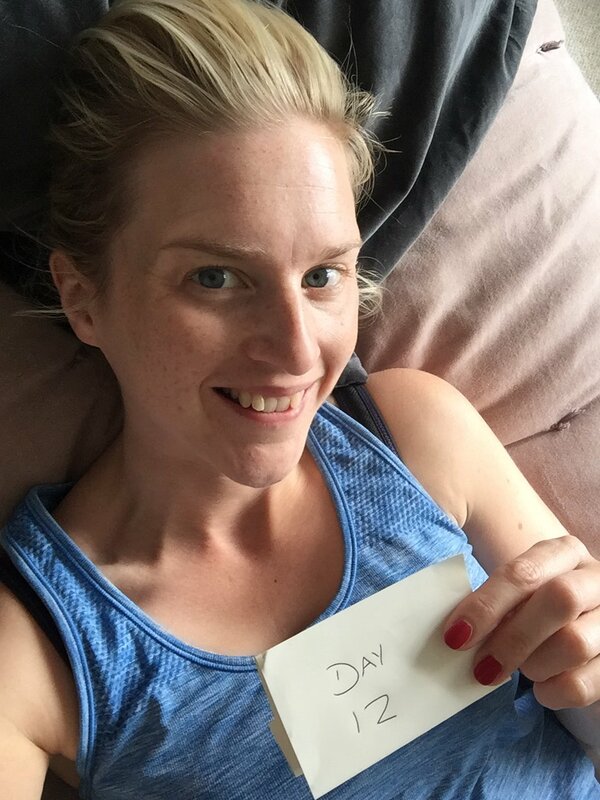 Anna has two young boys, Sam and Oliver, and has been blogging throughout her bowel cancer journey at https://my-semicolon.blog/. You can donate to Anna's JustGiving page here. If Anna has inspired you to take up a challenge then do take a look at our fundraising page.